The panel was moderated by Brian Cunningham and was attended by Jeff Lemire, Geoff Johns, Ray Fawkes, and Matt Kindt. SOME SPOILERS SO BEWARE! Booster Gold will not be appearing in Trinity War. However expect him in the intro to Forever Evil #1. John Constantine has a major role in the War. Constantine sees Shazam as the cause and goes after Billy Batson in Constantine #5. Expect to see Constantine actually wield the power of Shazam. According to Jeff Lemire he is a major wildcard in the war’s outcome. Trinity War is in essence an Identity Crisis Story in that the heroes will no longer trust one another. 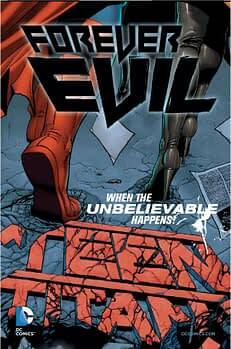 Trinity War and Forever Evil will be the official end of phase one of the New 52. According to Johns, almost every threat began in the first two years will be resolved. Jeff Lemire has big plans for Martian Manhunter in the new year. Dr. Fate will be making an appearance on Earth 1. Whether this is the Earth 2 Dr. Fate crossing over or a new Dr. Fate is unclear.